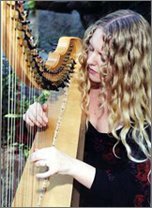 Harpist Diana Rowan’s playing has been described as having "unusual power and beauty." Born in Ireland, she lived on the East Coast, in Europe and the Middle East before settling in Berkeley, California. Diana’s classical training (MM Piano Performance with Tchaikovsky Piano Competition prize winner Roy Bogas, ongoing studies with Israel Harp Competition first prize winner Alice Giles) intersects with her love for Balkan, Eastern European, Sephardic and Middle Eastern music to create compelling solo and ensemble performances. Currently collaborating with, among others, her mentor Bon Singer's vocal ensemble Ya Elah, vocal virtuosa Lily Storm, Hindustani bansuri master Deepak Ram, and rising early music stars San Francisco Renaissance Voices. Diana also maintains a teaching studio while performing and recording frequently. Diana can be heard on many CDs and soundtracks for film and TV, including her debut solo album Panta Rhei. Diana’s second album, The Bright Knowledge, has just been released. "Her harp is lyrical and ethereal, yes, but also uncommonly primal and percussive, rife with her signature follow-through, where even aural decay delivers deeply felt musical nuance. - Laura Glen Louis, author of "Talking in the Dark"